Thinking of out-of-this-world colour schemes bring it on with Terrazzo! If you think no one can provide you with the colour schemes you want for your terrazzo projects then think again! Terrazzo Australian Marble will take the challenge head on and prove you wrong! Very wrong indeed! You simply won’t believe your eyes when we do justice and a lot more with the colour concept you have in mind and envisioned in your head. Go ahead we dare you to think of an unthinkable shade or hue and our professional and expert colour mixers will create a specially designed distinct mix specifically for your requirement! A shade concept and design tailor-fit to your specifications! Down to the minutest details! While there are already a large number of standard hues available that are practically limitless, we are exceedingly confident that we can still provide shades that are still in the inner recesses of your highly creative imagination! In the previous article in-depth what are Terrazzo Tiles. In this article, we will be sharing some inspirations for commercial establishment. These have been used for airports, railway stations and shopping centres. 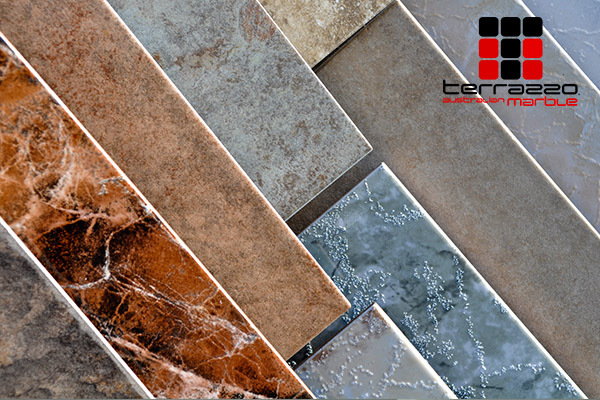 Before we go any further, it would be best if you familiarize yourself with the different colors of Terrazzo Tiles. Knowing these colors can help you select the best ones for your next project. To learn more about different colors visit here. For a more high contrast look, you might want to explore this. These colors are ideal if you want to have an edgy, elegant or professional fee. This colors work well if you want to depict formality on your projects. Using white tones portrays cleanliness, simplicity and purity. It has an effect of making a place bigger on a person’s eye. If you want neither white or black, you can opt for neutral colors. This color have hints of colors. It is less saturated. Many designers appreciate this tone, as this gives a mild attitude for a place. Use this if you are screaming for personality for your project. Colors are more saturated. Making things pop out even more. It really depends on the branding or the message designers want to convey. Colors reflects a emotions and expressions. * Classic Simple Design– This is a conservative approach for design. Tiles are neatly arrange forming basic geometric pattern. Nothing too fancy. This is ideal if you want to portray a level of formality for your retails spaces and commercial spaces. Terrazzo Tiles sample: basic block within a block. Dark Terrazo Tiles are used to highlight the center. Dark ones are also use as skirt to the wall. * Mildly Artistic Design– you can form more advanced shapes and design patterns using tiles. Example of Terrazzo Tiles using black and neutral colors forming advanced geometry. Another sample of Terrazo Tiles inside a mall using advanced patterns. Mixture of neutral and dark colors. * Pinterest – tons of photos of interior design. They also have patterns for tiles for any type of room and spaces. * Houzz– You can get lots of inspiration here as well. Architects and interior design share their works in this app and site. Hope we were able to enlighten you on the different Terrazzo Tiles. If you need more inspiration feel free to browse around. Contact us if you need further help our friendly staff will be happy to assist you.